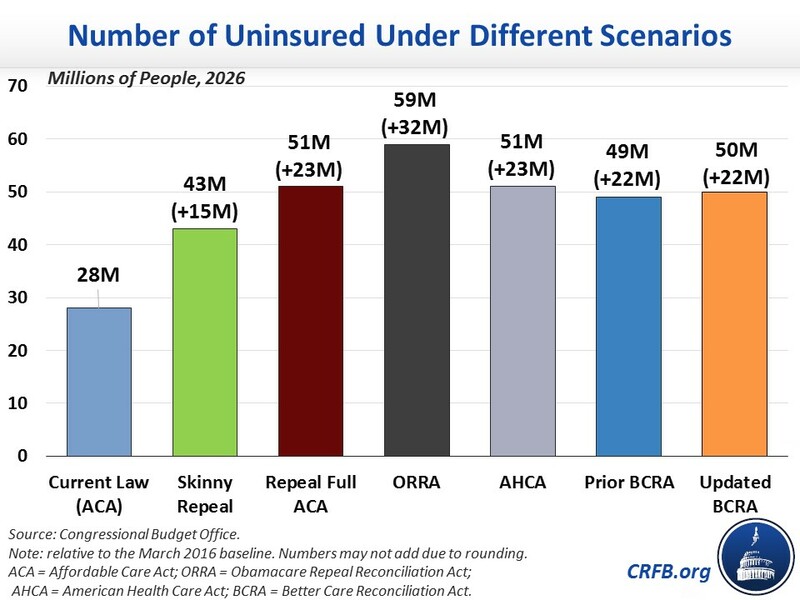 Home » Blogs » Scoring "Skinny Repeal"
Update (7/27/2017): This analysis is now out of date. The Congressional Budget Office (CBO) released a score of a hypothetical "skinny repeal" bill. The differences from our cost estimate and CBO's come from two main sources. First, three additional provisions are included in CBO’s score that were not included in earlier press reports on the bill: defunding the Prevention and Public Health Fund, funding Community Health Centers for two years, and prohibiting funding for one year for Planned Parenthood. Second, CBO has apparently updated its estimate of savings from repealing the individual mandate. CBO now estimates that spending on Medicaid will fall by $220 billion under this provision (as opposed to $279 billion in their December report) and that spending on exchange outlays will fall by $60 billion (as opposed to $92 billion), among other changes. Press reports indicate that the latest Senate health care plan is to pass a "skinny repeal" of the Affordable Care Act (ACA or "Obamacare"), which would repeal only the penalties for the individual and employer mandates and the medical device tax. Although the Congressional Budget Office (CBO) has not scored these provisions together, past CBO estimates can inform us as to what it might estimate for the fiscal and coverage effects. CBO has estimated that repealing the individual mandate alone would save $416 billion over the next decade, increase the number of uninsured individuals by 15 million by 2026, and increase premiums in the individual insurance market by 20 percent. The budgetary effect is the result of $381 billion in lower spending – almost three-quarters of which would be from Medicaid savings ($279 billion) – and $35 billion in additional revenue, a net increase from increased taxable compensation and some revenue loss from eliminating penalty payments. CBO indicated that the deficit reduction from repeal of the individual mandate is a direct result of the reduction of coverage; costs decrease because fewer people receive subsidies and Medicaid benefits. Eliminating the employer mandate penalty, on the other hand, would likely not have much of an effect on insurance coverage but would cost about $171 billion in lost revenue from the penalties. Taken together, we estimated that repealing the mandates (or in this case, the mandate penalties) would save about $250 billion over the next decade. Additionally, both the American Health Care Act (AHCA) and the Better Care Reconciliation Act (BCRA) would have repealed the medical device tax, which the Joint Committee on Taxation (JCT) found would cost about $20 billion over a decade. Thus, skinny repeal would likely result in $225 billion of deficit reduction over the coming decade, exceeding the reconciliation requirement that the Senate bill include at least as much savings as the House-passed AHCA ($119 billion). Sources: Congressional Budget Office and Joint Committee on Taxation. All numbers are measured under the 2017-2026 budget window. Because eliminating the employer mandate penalty would likely have a small impact on coverage, the total coverage loss would be 15 million by 2026, due to repeal of the individual mandate.